On these balmy evenings, what could be better than a cold beer outside? There aren't many pubs in central London with beer gardens, but head into the neighbourhoods and you will find some gems. Here's my pick of places to drink outside. 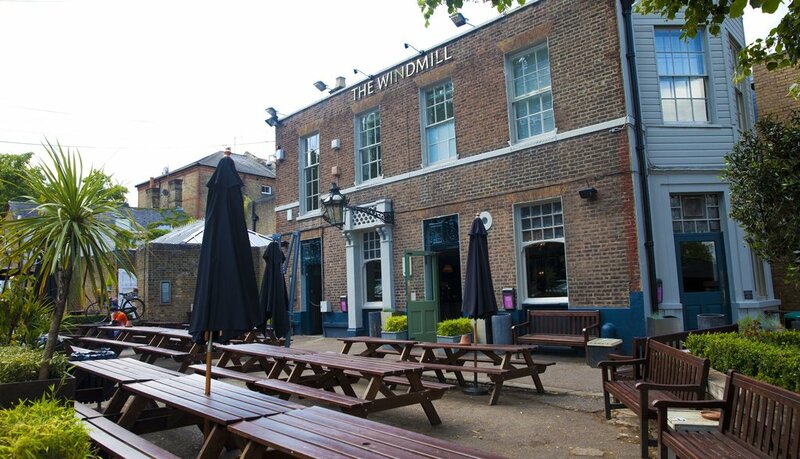 Perfect for a summer's day: The Windmill, Clapham. Clapham Common is a great expanse of green space in South London and this pub is the perfect stop off if you've been out enjoying the sun. The bar in this chichi boutique hotel boasts three outdoor areas. The Alfresco Garden is outside the conservatory dining room (a pretty place to dine if the weather is not so fine), and this is where you can indulge in the restaurant's menu of 21-day-aged steaks, pub classics, such as pork and London beer sausages with creamy mash and kale, or interesting vegetarian dishes such as smashed avocado and spiced yoghurt on sweetcorn cakes. Then there's the pub garden with its own outside bar and more relaxed seating and finally the Burger Shack, if you are looking for a tasty bun to enjoy in the sun. The garden at The Avalon in Clapham South, London. Also in Clapham is this gastro pub with a huge beer garden that is alive with fun-loving locals on warm weekends. The garden has a range of seating options, including wooden benches, bar stools arranged around old barrels and traditional cafe-style tables and chairs and lots of foliage and flowers. There is also a lovely little courtyard garden, which is used on weekday evenings when the garden is closed, with wooden booths to dine at. The menu is inventive, with dishes such as sea bream with lemongrass broth or asparagus, courgette and mint risotto. 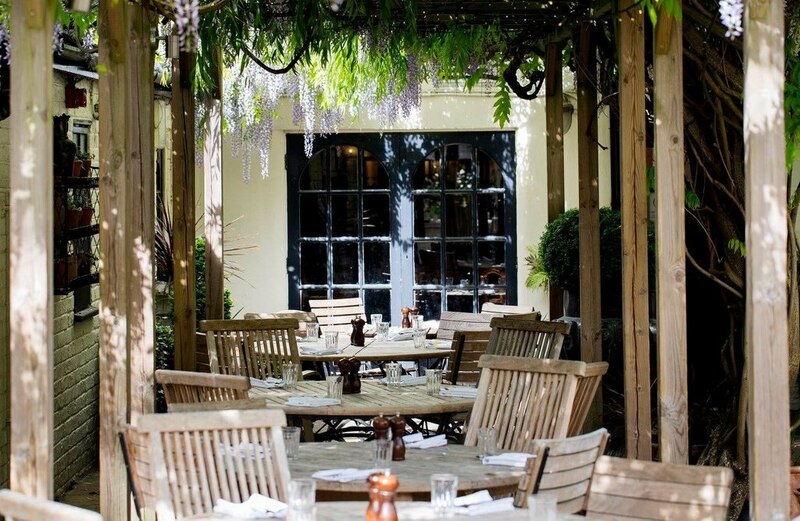 The picturesque walled garden of this North London pub is a perfect place to while away an afternoon and forget the hubbub of the city. The pub itself has been in situ since the Georgian era, when this part of London would have been leafy countryside and you get the same sense of retreat now as you would have then. Classic dishes such as beer battered fish and chips and chicken and mushroom pie are cooked to perfection. Come on a Sunday for their renowned roast lunch. 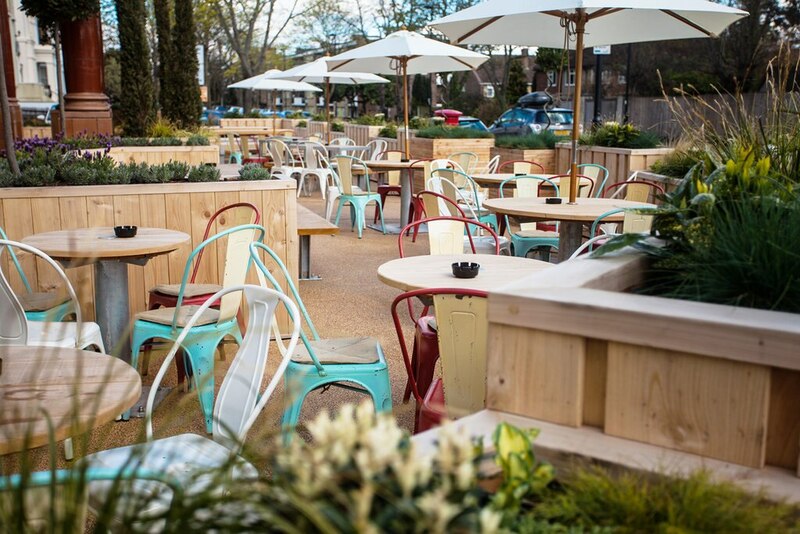 The terrace of The Rosendale in West Dulwich, London. This neighbourhood pub in South London has a sunny front terrace with larch log benches and feasting tables that seat up to 20 people. An outdoor rotisserie and bar opens on warm, dry weekends. In addition to the terrace, there is a large side garden which can be hired out, equipped with a children's play area, a ping pong table and a boule pit. The Ship pub in Wandsworth. 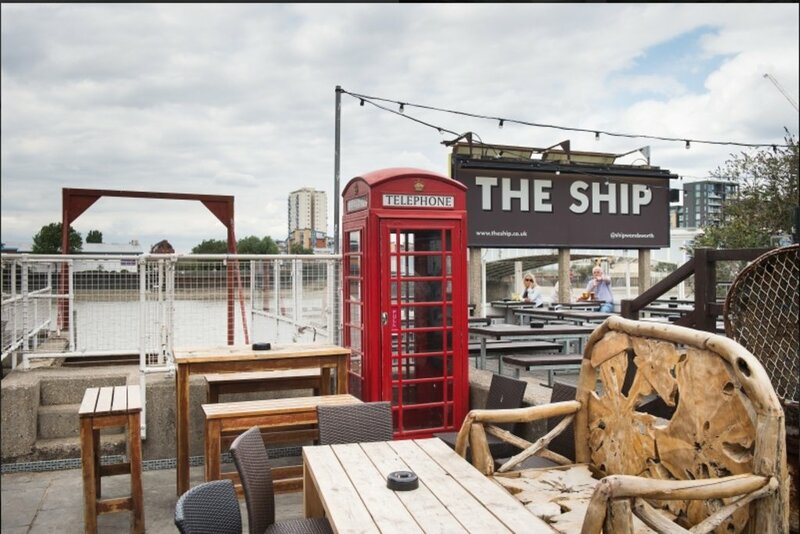 With its enviable position right on the Thames, The Ship in Wandsworth is one of London's most popular summer venues, offering a stunning Thames-side terrace, and impressive drinks menu. Tuck into a multitude of BBQ favourites from their state-of-the-art, outdoor American flat grill as well as sumptuous burgers including The Streaky and The Chilli Pulled Pork from the Burger Shack, open until 22:00 every day throughout summer. Grab a drink from the terrace Doolali Bar before disappearing into a riverside cabin, or take a seat dockside to soak up the sun. 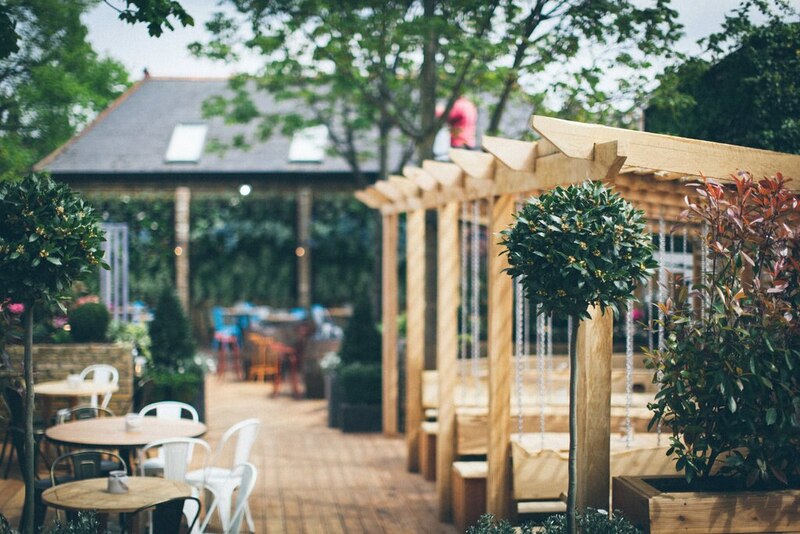 Want to visit these beer gardens this summer? Check out our London hotel deals to start planning your trip.